The Canyoneers river guides recently went on a training trip in Grand Canyon, starting with the put-in at Lees Ferry on April 1. The weather was all over the place: hot to start, but snow on the river on the last morning! As usual, our intrepid crew had to (and did) handle everything with amazing adeptness. 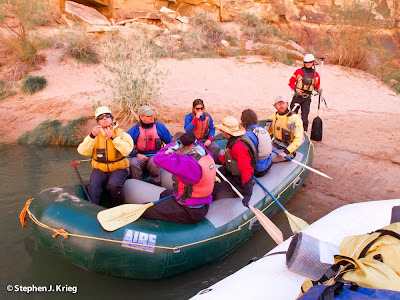 One of the highlights of the trip was the paddle raft that Cassie brought along. She conducted orientation on paddle boat technique during the scout of House Rock Rapid, then they ran it. Interest was high in the paddle raft because it's going to be along on our River History Special oar trip in August. Find out more about that trip on our News and Specials page.